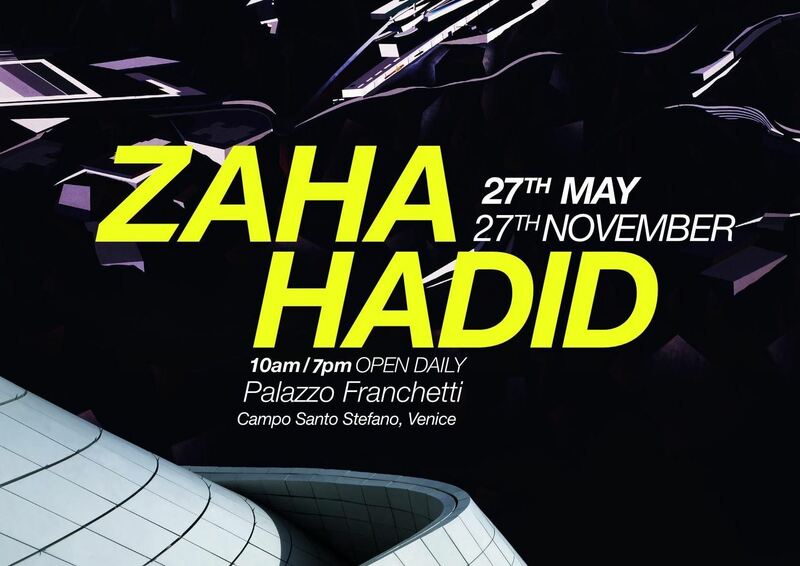 In celebration of Zaha Hadid’s career in architecture and design that spans four decades, Fondazione Berengo hosted an abridged retrospective exhibition of her work at the 16th century Palazzo Franchetti. The exhibition, coinciding with the 2016 Venice Architectural Biennale, showcased many of the seminal paintings, drawings and models of Hadid’s repertoire, conveying the ingenuity and dynamism of her architectural projects in a variety of media including photography and film. Through Hadid’s designs – built, under-construction, in development and unrealized – the exhibition displayed the pioneering research and investigation that instigates and defines Zaha Hadid Architects’ work. Hadid directly engaged with the experimentation of the Russian Avant-garde early in her career, exploring the compositional techniques of fragmentation, layering and porosity that transcend all her projects. Her early works displayed include Malevich’s Tektonic (1976-77), Hadid’s fourth-year project at the Architectural Association School in London that bridged the River Thames. Also showcased are the competition winning Peak Club, Hong Kong (1982-83, unrealized); Hafenstrasse, Hamburg (1989, unrealized); Grand Buildings, Trafalgar Square, London (1985, unrealized); Victoria City master-plan for Berlin (1988, unrealized) and the Cardiff Bay Opera House (1994-95, unrealized). Three projects representing milestones in Zaha Hadid’s career were presented in their own room. Beginning with the Vitra Fire Station (completed 1993) in Weil am Rhein, Germany, Zaha Hadid Architects’ first completed project and followed by the Rosenthal Center for Contemporary Art in Cincinnati (completed 2003), which contributed to Zaha Hadid being awarded the Pritzker Architecture Prize in 2004. Concluding the room’s projects is the MAXXI Museum of 21st Century Arts in Rome (completed 2009) which transcends the periods in which the practice implemented and developed its wide-ranging experimentation with the rapid advancements in computer-aided design. Helene Binet’s photographs, capturing the integrity and materiality of Hadid’s projects, were also showcased in their own room. Binet began her relationship with the practice photographing the Vitra Fire Station in 1992 and has continued to the present day with powerful images of many of the firm’s works including the Salerno Maritime Terminal in Italy which was inaugurated in April 2016. All of Zaha Hadid Architects works in progress will be exhibited, including projects that were completed in the coming year. The Port House in Antwerp was inaugurated on 22 September. Its design preserves and repurposes an abandoned 95-year-old fire station into a new headquarters for the port. The King Abdullah Petroleum Studies and Research Centre (KAPSARC) in Riyadh is a non-profit institution that brings together people from around the world to research and tackle energy challenges for the benefit of society and the environment. KAPSARC is built with sustainable construction methods and materials to LEED Platinum certification, and designed to work with its natural environment to ensure comfort for employees alongside minimizing energy and resource consumption. The Mathematics Gallery at London’s Science Museum opened in December 2016. A pioneering new gallery that explores how mathematicians, their tools and ideas have helped to shape the modern world, its design and layout is defined by mathematical equations that are used to create the 3D curved surfaces representing the airflow patterns that would have streamed around the historic 1929 aircraft at the center of the exhibition. Also included in the exhibition were models, relief studies and visualizations of a residential building on the High Line in New York.